On this Father’s Day, 2015, I would like to honor my father, Donald, and talk a little about his life and legacy. Born to the son of a Czech brewery owner and the daughter of a German brewmaster, he grew up in western Minnesota during the Great Depression and learned art from an aunt. He quit school, married young, and spent his early years as an itinerant sign-painter. After two sons were born, he was drafted in World War II and was sent to France where he fixed jeeps and also painted signs to help the swiftly advancing troops know where to go. After the war he became divorced and raised his two sons alone. Later he met his second wife and had four more children. In the late 1960’s he started a rubber parts business and its success meant he had to give up sign and portrait painting until his retirement in the 1980s. He passed away December 1991 at the age of 71. As the youngest of his six children, I was 24 when he died. Now that I am 48 … I have now spent half of my life without him, and that is hard to believe. My two oldest half-brothers were more like uncles to me, and one had four children before I was born, making me “baby-uncle”. This also means that, since one of my nephews is a grandfather, I am now a Great-Great-Uncle … very strange! My father had many faults, and these have left a legacy of scars throughout my extended family … as well as myself. Yet he also had many positive traits, among them was his artistic skill, which he endeavored to pass on to any who would learn from him. This artistic legacy still lives on to this day. Three of his six children have spent periods of their lives making money by being an artist of some sort, either from graphic arts, video, or sign-painting (something my father did for many years). The rest all have artistic skill, whether or not they have taken advantage of that gift. I, among them, consider myself an accomplished artist and graphic artist. My oldest daughter works for an advertising agency doing photography, video, graphic design, and websites. My son is a full time photographer, artist, 3D modeler, and filmographer. My younger daughter is very creative, showing talent at drawing and jewelry design. One of my nephews was a sign-painter and designer for many years, and is now a galleried artist. Another nephew works as a graphic artist, 3D modeler, and photographer. One of my other nephews makes his living collecting rare art, along with other artifacts. 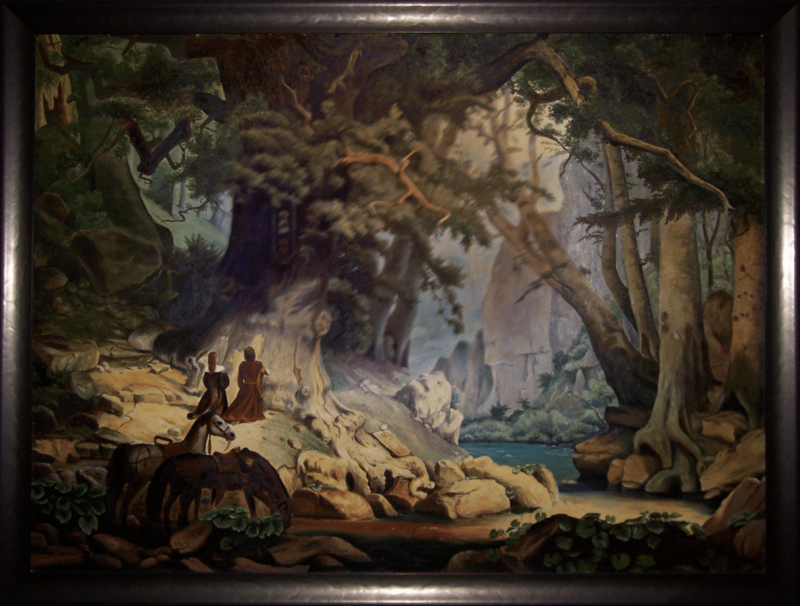 My father’s greatest painting was an incredible reproduction of Karl Friedrich Lessing‘s masterpiece “Die Tausendjährige Eiche” (The Thousand-Year-Old Oak). This huge painting sat over the couch while I was growing up, and I never tired of studying its skill, symbolism, and beauty. Today my nephew Josh has it proudly displayed in his New Jersey home, and I have seen it twice while visiting him. Once I took some photos of it. Unfortunately, one photo (taken without a flash) turned out blurry, and the other, though clear, had camera-flash that whitened out the center. Today I have combined these two photos to make the best of both: the crispness of the second photo around the edge, with an overlay of the blurry section to fix the flashed-out center. You may click the painting to see a larger version, and then click that once again to zoom in. If you would like to compare this to the original painting by Karl Friedrich Lessing, click here, and you will be quite surprised by my father’s accuracy. This entry was posted in Activities, Family. Bookmark the permalink. ← Merlin’s Nightmare: a 2015 Clive Staples Award semi-finalist! It is interesting how the choices we make influence the generations to come. My dad has painted some amazing paintings. He doesn’t pursue it as much now, but I hope he can when he retires. Thanks for sharing! Thank you for sharing your father’s story and his art. My own father was not old enough to take part in WW2 but was in the Navy during the Korean War era, though he never was sent to Korea. He was in charge of stores/supplies since he’d worked in a grocery store before enlisting. His career post-navy was as a store manager for the Kresge company, later Kmart. My father passed ten years ago, and it still seems strange that he’s not around to talk to every day. I think the men of the generation of your father and mine were a special breed, and I’m not sure subsequent generations are their equal.